In a medium sauce pan, bring water to rapid boil. Slowly pour oatmeal into boiling water, stirring constantly. Return to a boil. Reduce heat and simmer for 8 to 10 minutes, stirring occasionally. Remove from heat and let cool. Mix the oatmeal, yogurt and honey together. Chop the orange into small pieces. Divide the mixture into 4 bowls or jars. 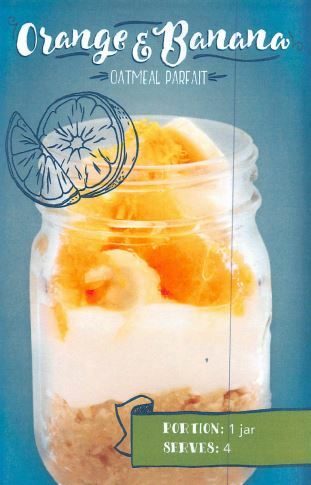 Top each parfait with 2-1/2 tablespoons each of banana and diced orange and 1 teaspoon orange zest. Serve cold. I am lactose intolerant. What can I Use instead of yogurt? At CPC, we encourage our patients to be in charge of their healthcare. Success in good health comes from a thriving partnership between patients and our doctors and staff. We encourage patients to be knowledgeable about their health and be responsible about the decisions involved in their health care. © 2019 Carolinas Pain Center. All Rights Reserved. Website by Vale Studios.